An attractive example of Blaeu's seventeenth-century map of Cumbria. Some age toning and foxing. Centre fold. "The finest Dutch map publishers were the Blaeu family, and they hold the title of mapmakers supreme for any period of cartographical history." (R. Baynton-Williams, "Investing in Maps"). Willem Janszoon Blaeu (1571-1638) was the founder of the Blaeu publishing house and established the fine reputation of Blaeu maps. In 1634 he commenced publication of the "Theatrum Orbis Terrarum" or "Novus Atlas" and on his death he was succeeded by his son Johannes (1596-1673). Johannes continuously enlarged and updated the "Theatrum" up to 1658, including adding a separate volume volume devoted to England and Wales. In turn, the "Theatrum" was itself expanded to form the magnificent "Atlas Maior", published from 1658 to 1672 in five languages, and generally regarded as the pinnacle of atlas- publishing. The "Atlas Maior" finally incorporated over 650 maps, often found in the loveliest contemporary colour. 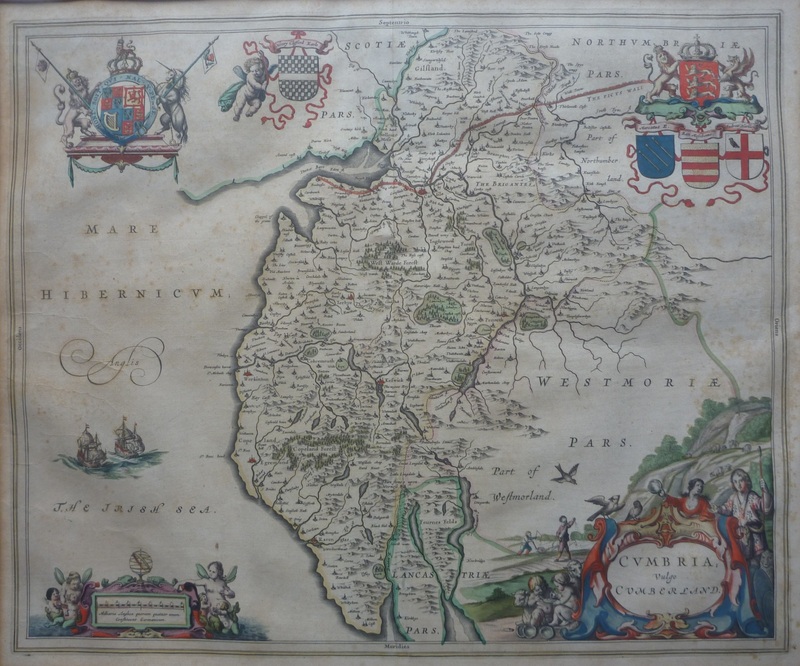 Blaeu maps are renowned for the consummate care and attention apparent in every stage of production - using only the best paper with finely engraved plates and a high standard of printing. The county maps are no exception and often depict the coats of arms of those families with important county links, as well as decorative title cartouches. mapmaker: Place and date of publication: Amsterdam 1645 -1662-medium and colour: copperplate. size in cms: 41 x 50.5 to plate marks.